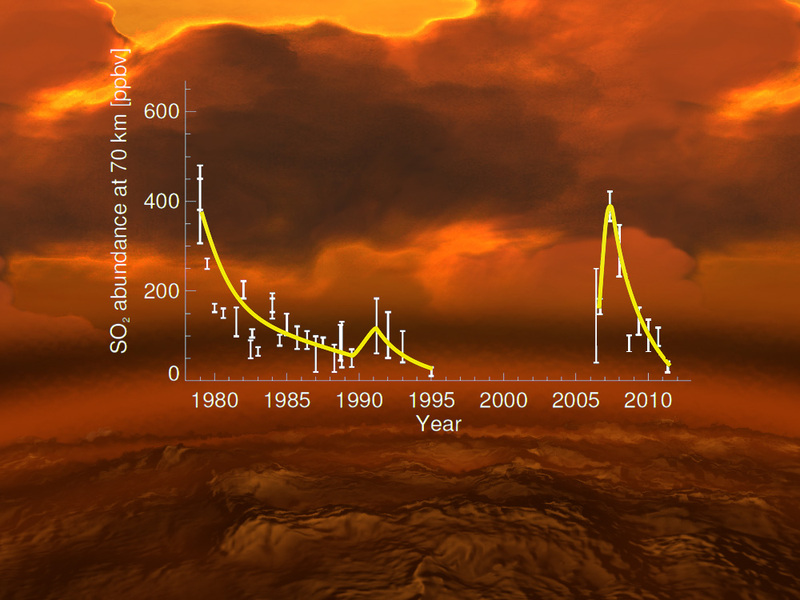 The rise and fall of sulphur dioxide in the upper atmosphere of Venus over the last 40 years, expressed in units of parts per billion by volume (ppbv). The dataset on the left is mostly from NASA's Pioneer Venus, which was in orbit around Venus from 1978 to 1992. The dataset on the right is from ESA's Venus Express, which has been studying Venus since 2006. A clear rise in the concentration of sulphur dioxide (SO2) concentration was observed at the start of the mission, with a subsequent decrease. The increase in sulphur dioxide can be interpreted either as evidence for volcanic activity or for decadal-scale variations in the circulation of Venus' vast atmosphere. The data are superimposed on an artist impression of Venus, depicting a volcanic terrain surrounded by a thick, noxious atmosphere. A new episode of active volcanism on Venus?